Joys of biking around Burlington, Vt.
About 400 birdhouses attract tree swallows in a meadow on South Hero Island. A handful of new houses are added every year. URLINGTON — On the left, the waters brush the boulders a step or two away, then recede to murky silhouettes of a mountain range. On the right, more water, more mountains. Yet, as you bike southerly atop the long thread of the Colchester Causeway under the late afternoon sun, the two views are starkly different. To the east, the indigo blue waters of Lake Champlain are warm, placid, and inviting; the backdrop of Mount Mansfield and its Green Mountain brethren is majestic. To the west, flicks of light skip across choppy brittle-blue waves; to find the Adirondacks across the horizon, you need to squint against a descending, domineering sun. This two-wheeled dualism is one of the many joys of biking from South Burlington to South Hero Island and back. 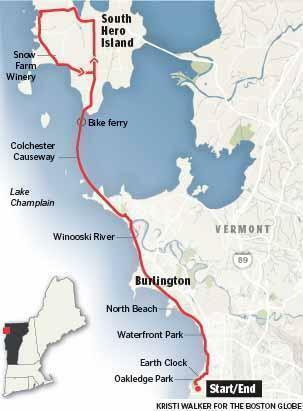 If Boston still has pretenses of being the Hub of the Universe, perhaps we could cast a vote for Burlington as Hub of the Alternate Universe. A case in point is stop one on your day of biking, named, simply, The Spot. The cafe is a converted 1930s-style, bat-wing Phillips 66 station; the food a tasty mix of breakfast standards, organic Tex-Mex, and island sweet and spice; the decor and vibe, surfer dude-ism (yep, an homage to hanging 5 on big Hawaiian waves in land-locked Burlington.) At this Spot, the Big Island Kona will lift your energy, the huevos rancheros your stamina, and the dozens of its posted photos of surfers your mojo. 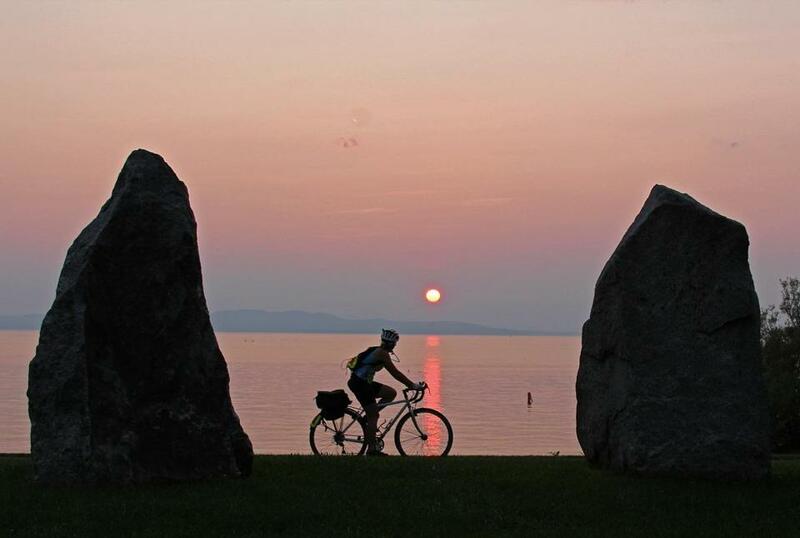 Your cycling trek begins about three blocks away, at Oakledge Park in South Burlington, fronting Lake Champlain, the biggest body of fresh water in New England and your companion for most of the next 30 or so miles. The ride north begins eclectic. The Island Line Trail along the picturesque park quickly slips through residential blocks and passes a rail yard. Before the sweat begins to gather around your temples, you’re at downtown Burlington’s inviting and innervating Waterfront Park. Even though your journey has just begun, stop for a moment to look around. This is one of those wondrous New England splicings of nature’s waterscapes and humanity’s artifice, rivaling Castle Island in Southie, town wharf on Nantucket, and the Cliffwalk in Newport. In front, the lake spreads to the stunning, clipped horizon of the Adirondacks. Behind you, off-beat Burlington beckons. As you ride on, take note of North Beach, a candidate for a cooling dip on your return. A decision awaits as you approach the bridge spanning the Winooski River: pedal on or paddle for a bit. The Auer Family Boathouse, tucked beyond a thicket of scrub trees where the river spills into Lake Champlain, offers kayaks, canoes, and a slice of Burlington lore. Spend an hour bird-watching and exploring up the river or tarrying along the curves and coves of the lake. Even if you decide to skip the boat, stop by and grab an ice cream or burger or story from Charlie Auer. His family has offered travelers, fishermen, and paddlers a bucolic respite and good cheer for 87 years. Back on the bike path, you’ll soon come to the causeway, spearing into the waters blue. It’s a 2-mile trek with a 200-foot twist: Near the end of the stunningly beautiful ride in, as you approach South Hero Island, the path abruptly ends, creating a gap that serves as a sailor’s passage between two lobes of the lake. At the breach, the funky Local Motion bike ferry awaits. For $8 roundtrip, the captain and mate will take you and your bike those last few feet from mainland to island. Up until this point, the path has been smooth and flat. Once on South Hero Island, however, the potholes will rattle the fillings from your teeth and, if you don’t take care, the air from your tires. Asphalt, blessedly, arrives after a couple hundred yards. The trek on the island is a loop along country roads. The sight lines are good, even as the roads become hilly. South Hero Island is named after Ethan Allen, Revolutionary War hero. The final ride of Vermont’s original Green Mountain boy began in South Hero. Leaving the home of his brother here, Allen became ill with pneumonia and died in Burlington. You’ll find some markers along the island relaying his story. You’ll find, too, curious vestiges of a story equally intriguing, if not as heroic: that of Harry Barber. Born in Switzerland, disabled in a work accident in France, and infatuated with the idea of living in Chile, the artisan Barber found passage across the Atlantic in the 1920s and ended up in Montreal. From there, he set off to walk to Chile, making it as far as South Hero, where he fell in love, married, and settled. Pining for his native land, Barber took to the fields of South Hero, gathering stones to build reminders of Switzerland: miniature castles so exquisitely detailed that some had leaded glass and running water. Island homeowners hired him to replicate his visions in their gardens and lawns; several can be still found. Take in his story at the Snow Farm Winery and Vineyard, a font of island history, culture, and upcoming events in addition to glasses of crisp seyval blanc. Sitting at the bar or at the outdoor patio is a fine way to reflect on the road taken and the road back to South Burlington. Burlington's earth clock offers a contemplative place to take in the passing of another day. As you near the causeway again on West Shore Road, bursts of color catch your attention. Across the meadow, into the woods, and for as far as you can see, a metropolis of 400 or so riotously painted birdhouses attract both mosquito-gulping swallows and the attention of bicyclists. There are dozens of places a hot biker can cool off in Lake Champlain, perhaps none more satisfying than a jump near a small bridge on the causeway. The swimmer can float across to both sides of the lake. To quench a different kind of thirst on your return trip, you will find that the bars and cafes of Burlington, centered on Church Street, are a mere four blocks from Waterfront Park. A warning for the weary: Those four blocks are sharply uphill. As you come full circle back to the starting point at Oakledge, take a moment in the city’s earth clock. Emulating ancient megalithic sites such as Stonehenge, the clock uses a ring of 14 massive boulders, a sundial, and sunlight to chart the cycles of the season and the spins of the Earth. It’s a wildly contemplative place of matters ephemeral and eternal. Silhouettes on bikes, skateboards, and foot slice across the golden path of the setting sun as you sit among the obelisks, seemingly centered on life’s stillpoint, until you realize you’re in the middle of a timepiece that is measuring our home spinning 1,000 miles an hour as it hurtles 66,000 miles an hour elliptically around the sun. Before you slip too deep in the cosmos, an antidote is a few pedals away — the Switchback Brewery. Rely on a Dooley’s Belated Porter to transport you back, perhaps, to an alternate reality. Michael Bailey can be reached at michael.bailey@globe.com.